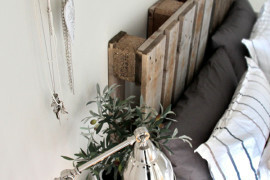 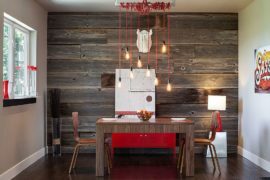 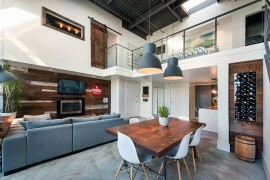 The beauty of reclaimed wood is finding new purpose in contemporary households across the globe, with designers keen to add textural beauty and contrast to polished modern interiors. 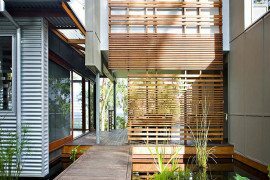 Reclaimed timber varies a great deal both in terms of quality and longevity, with some working well even in the harshest of conditions while others fade away quickly. 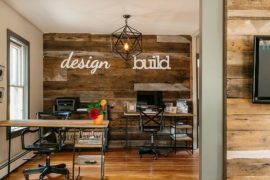 Yet it is a sense of uniqueness, weathered charisma and inviting warmth that is turning them into one of the hottest trends in home design. 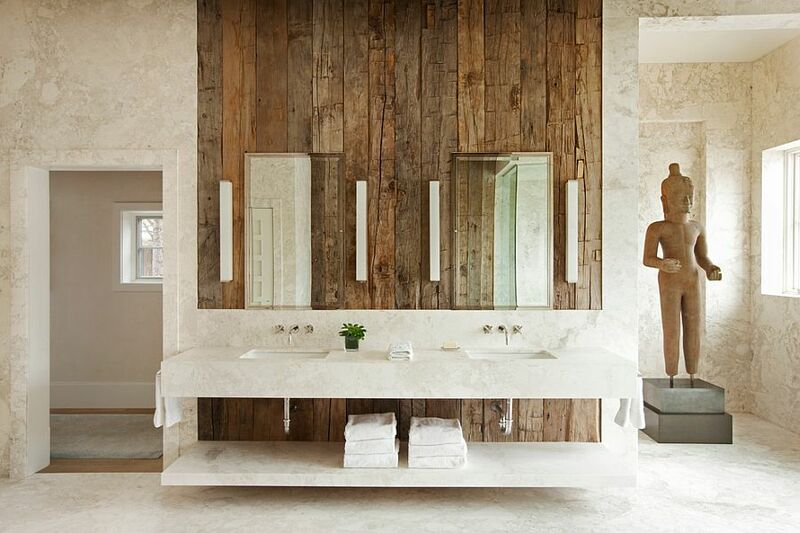 When most people envision reclaimed wood in the bathroom, they probably do not conjure up images as spectacular and imaginative as the one below! 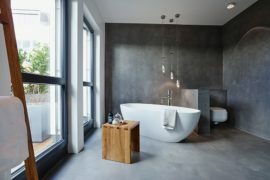 Stunning, dramatic and contemporary with a hint of industrial charm, this gorgeous bathroom features reclaimed timber flooring. 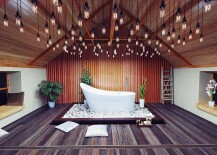 While it is the striking collection of Edison bulbs hanging from the ceiling and the opulent image of the bathtub that steals the show here, the flooring does its part by providing a fabulous backdrop. 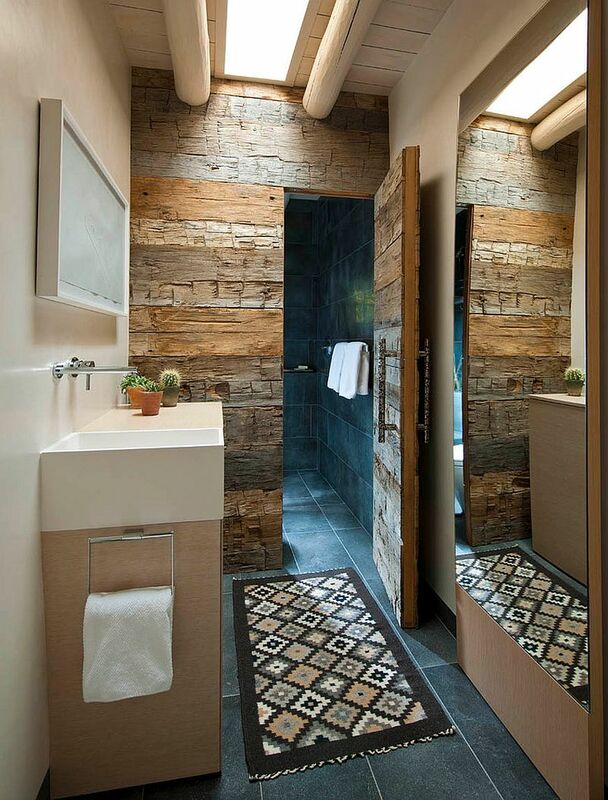 A door leading into the shower area covered in reclaimed wood does bring a dash of outdoorsy charm to the modern bathroom, but this visual effect is magnified when you have a wall next to it draped in reclaimed timber as well. 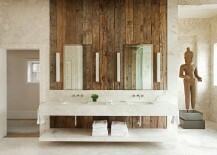 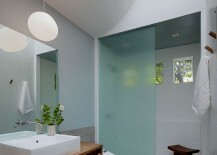 One can clearly see here the textural contrast and uniqueness that this reclaimed wood surface offers in modern bathrooms dominated by tile, stone and glass. 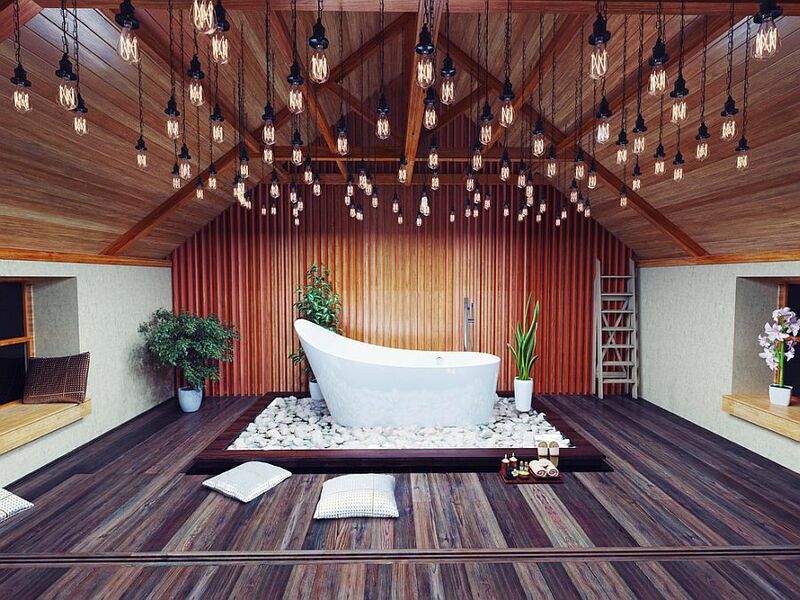 The idea of sweating it out in a sauna as the winter chill and snow-covered slopes take over the landscape outside is one of those wonderful little pleasures of life that we all crave. 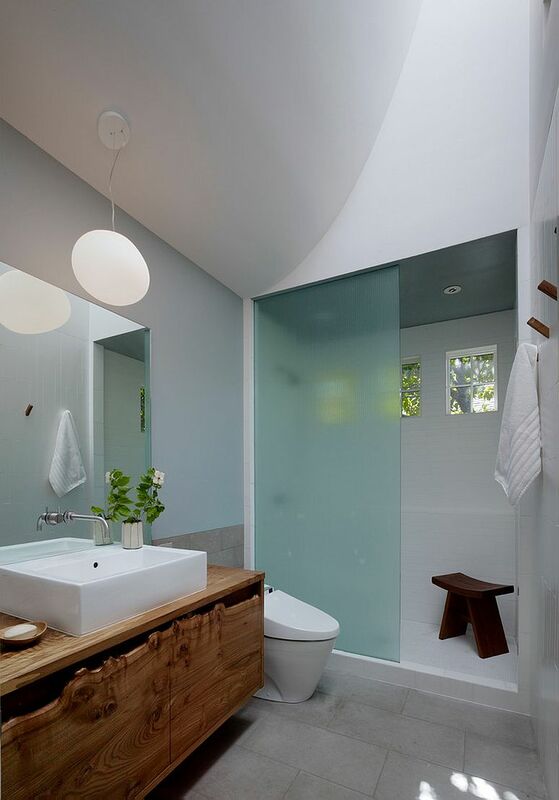 The lavish bathroom below takes this a step further with its fabulous spa that borrows from the woodsy design of those famous saunas in Finland and Sweden. 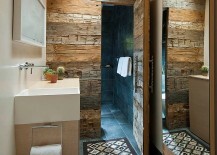 And reclaimed wood plays a big part here in recreating that atmosphere, as it turns the bathroom corner into a hot and relaxing world detached from the rest of the home. 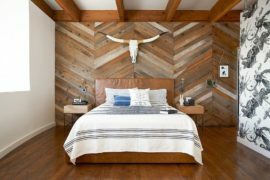 When you are using reclaimed wood inside your house, a good idea is to seal it so that moisture does not eventually seep in and wreak havoc. 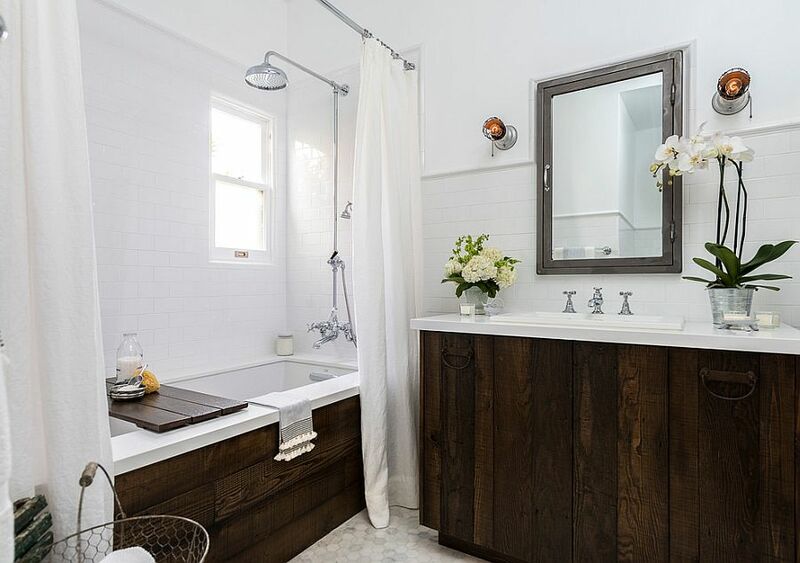 Of course, this becomes even more essential in the bathroom, and there are plenty of sealing agents out there (some good enough to protect the wood from constant exposure to water as well) that will get the job done without much hassle. 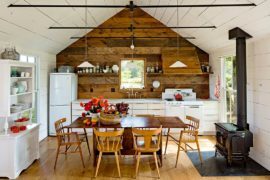 But a smart design like the accent wall below minimizes the risk of damaging reclaimed timber further because of the clever backsplash design. 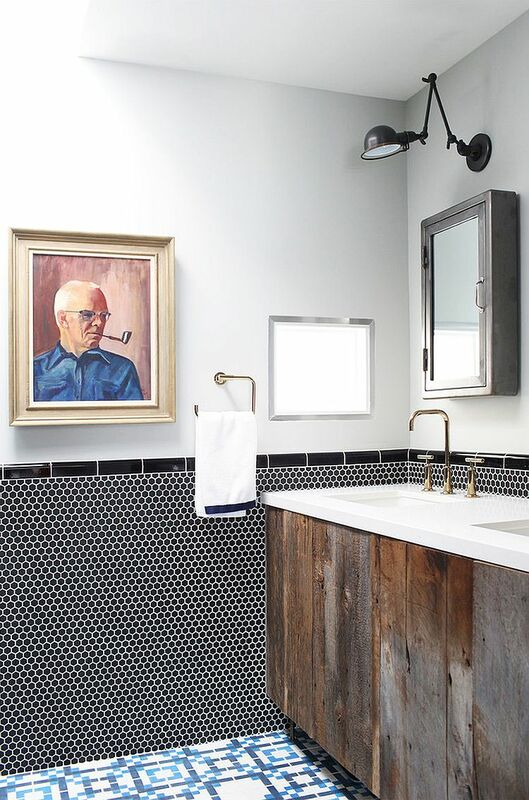 We adore the accent wall in reclaimed wood below, as it moves away from convention and turns the already existing statement piece into a wonderful work of art that enlivens the entire bathroom. 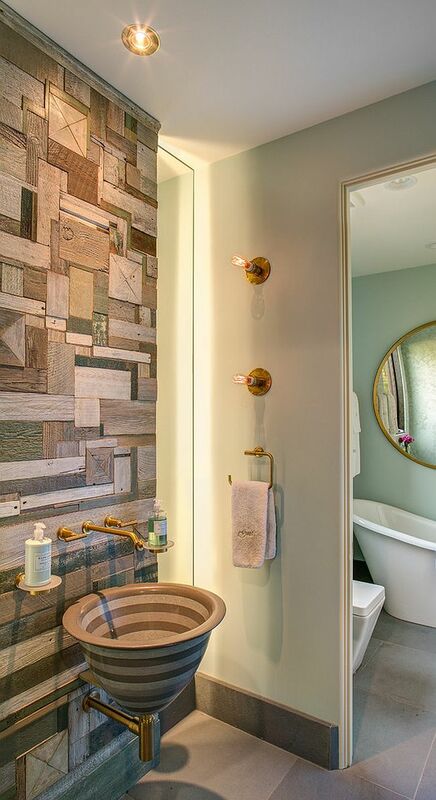 Created by artist Rob Payne from reclaimed timber pieces, the patchwork wall is a showstopper here, with a custom-crafted quartz vessel sink and faucets from Kohler completing the setting. 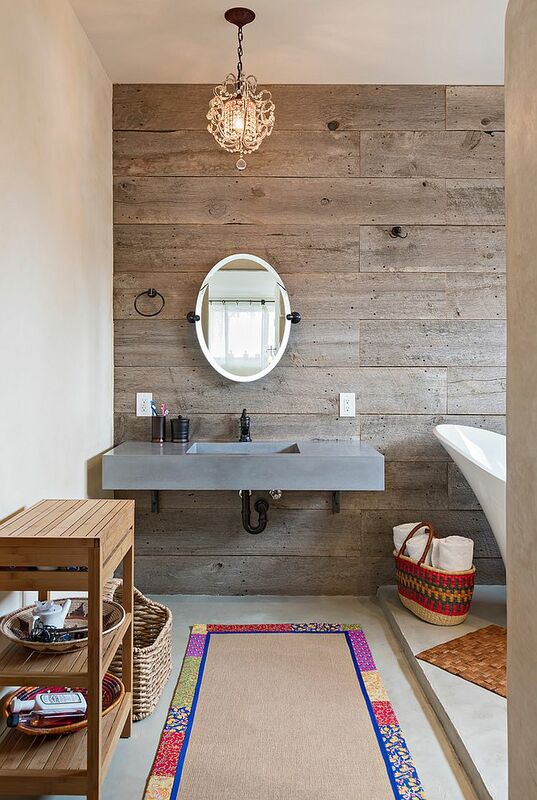 Showcasing a more traditional take on the wooden accent wall, the bathroom below uses reclaimed wood as a cost-effective option. 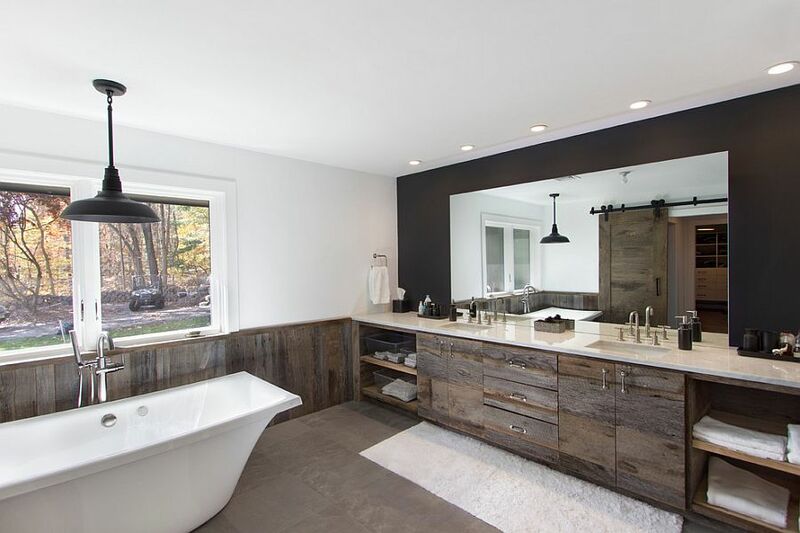 Finding sources for reclaimed timber is not very hard, but you must keep in mind that not every one of them offers reclaimed wood of the same quality. 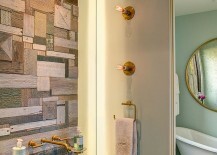 The mirror, sink and other décor pieces used in the bathroom also complement the style created by the accent wall perfectly, giving it a soothing and traditional vibe. 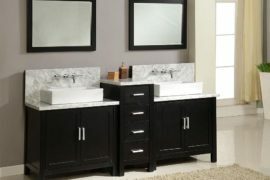 Reclaimed wood gives you a great opportunity to piece together an amazing vanity that features a woodsy base and a countertop in a material of your choice. 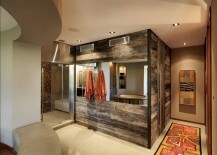 From marble and soapstone the options for the countertop are endless and this will also keep the reclaimed timber away from direct exposure to moisture. 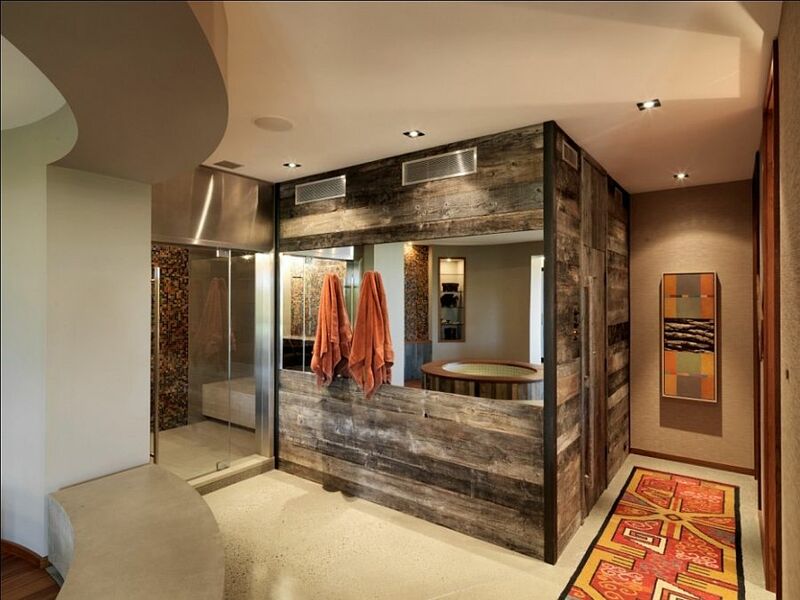 This custom vanity approach also allows you to blend contrasting styles such as contemporary and rustic in the bathroom with effortless ease. 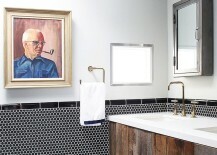 You can take this look a step further by repeating the reclaimed wood elsewhere in the bathroom to give it a more curated and exquisite appeal.